Active Query Builder lets you switch between visual query building and direct SQL text editing with no hassle. You always see the resulting SQL while designing a query; you can change the query text and get back to the visual query builder at any time. The component will parse the text and reflect the changes in the diagram. Such flexibility lets novice users learn SQL while building queries visually, while also giving experienced query writers an excellent SQL query visualization tool to help them better understand the structure of queries. Active Query Builder cares about keeping user query text unchanged. All the clauses and syntax-specific options will remain the same after query parsing and generation. Using Active Query Builder's SQL query text formatting tool, you can beautify the SQL code the way you need. 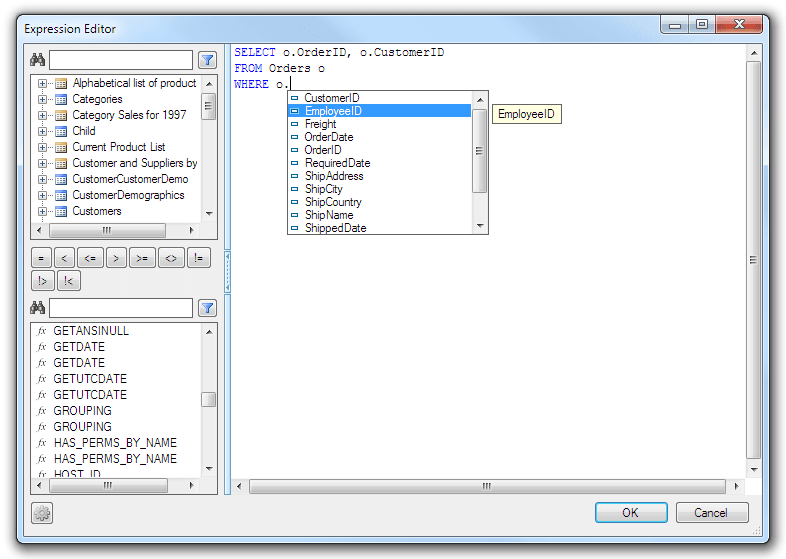 There are many options to customize the SQL query text layout, such as case, line breaks, indents and word wrap. Advanced formatting options allow you to set dynamic indentation of the first item in the list. Complicated SQL queries with multiple subqueries are hard to edit. Active Query Builder not only helps you understand complex SQL query structure, but also allows you to get and set the subquery text so you can edit the text of a subquery and apply it back to the query. You can work with the current subquery as if it were a separate query; then, when you get back to the main query, you see the entire query text. You can get the text of the currently active subquery using the Query Transformer API which allows you to apply limits to the query (TOP n records) and preview the subquery result. The Professional .NET Subscriptionadditionally provides the Advanced SQL text editor and Expression editor with code completion and syntax highlighting. It uses Active Query Builder's parsing engine SQL context to determine the current SQL dialect and display the proper completion lists.